Alkerton Road is a fictitious location somewhere between Birmingham and Bristol on the Midland and Western region main line. 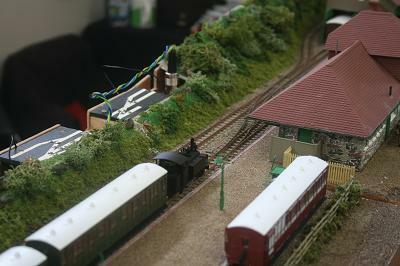 The layout is designed with a rural station to provide through running. The scenic boards are 12 inches wide. 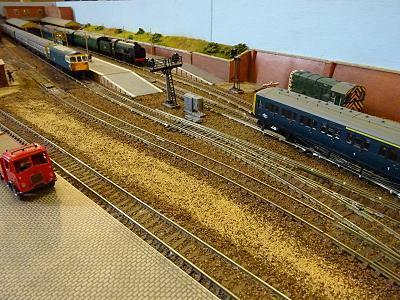 The intention of the layout is to show minimal uncluttered track as one would observe in the countryside. The station at Alkerton Road has a passenger/parcels bay platform with small engine maintenance shed left over from bye gone days. The structure comprises of kit bashed and scratch built buildings. 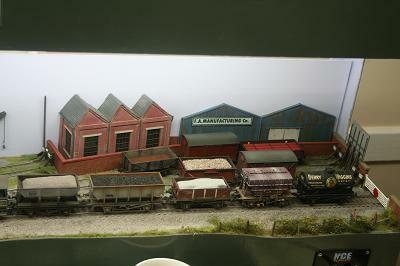 A small 9 road fiddle yard with automated points supplies the trains to the up and down lines. Signals are automatically operated by approaching trains. Rolling stock is a mix of steam and diesel depending on the era being run. Steam locomotives are a mix of Western Region, Mogul, Halls and Castles. Plus Midland Region steamers are Black 5, Jubilees, Patriots and Royal Scots. Diesel classes range from class 24's to 66's. Green and Corporate blue diesels run in the 1960's to 1980's eras. Local services are provided by diesel multiple units with the occasional High Speed Trains or Voyager passing through. All locomotives are fitted with sound mostly from our sound library. OO gauge code 75 track work is used with a DCC operating system controlling trains and points via a mimic panel. Allt-y-Graban Road represents an alternative existence for the bottom end of the Central Wales Line. The 1964 closure from Pontardulais to Swansea Victoria did not happen and a new colliery off a Ministry of Defence branch was opened. The junction ground frame was upgraded with a modern track circuited single lead junction complete with a new signal box - a Western Region type 37 “Plywood Wonder”. Control is by NCE Powercab and Procab. CT Elektronik and Zimo decoders are becoming standard. Points are worked by Cobalt motors via an NCE switch-8. The layout was not built using usual methods. The baseboards have no structural frames, the plywood exists only to protect the extruded foam slabs. Track is Exactoscale Fastrack laid on Woodland Scenics foam underlay fixed with Johnson's Klear, as is the ballast. 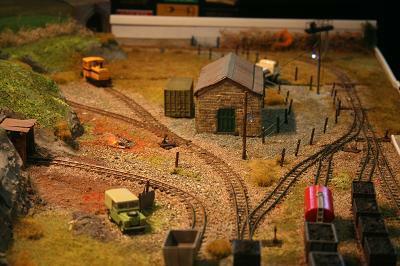 This is a first attempt at a P4 layout and the opportunity has been taken to see how many model railway conventions, clinches and habits can be ignored. This iconoclasm has undoubtedly led to "too many knobs being twiddled at the same time" and I will find out the hard way how few will have to be reinstated. Exceptional thanks to the late John "Ruyton Road" Spencer for the signal box, bridge and generous practical help and advice. Thanks also to Rod "Llanastr" Hall for the Templot plan. 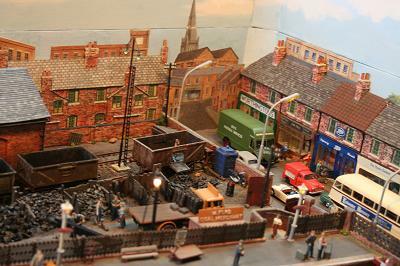 Set in the London conurbation, this small layout depicts a goods yard in a urban setting of factories, workshops and railway arch businesses. 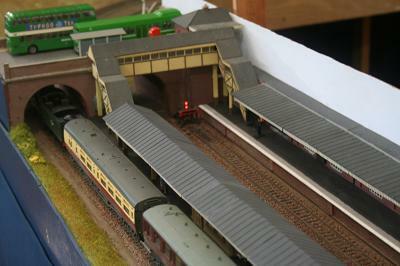 Above the arches runs a short section of London Transport trackage, leading to a maintenance and servicing shed. The track work is all Peco code 100 with electrofrog points, the LT section makes use of the third and fourth rail chairs and Z gauge conductor rail from the same manufacturer. Baseboards are made of 12mm plywood obtained as offcuts on a conventional 2 by 1 timber frame to give the necessary height to fit point motors and wiring. The backscene is of 4mm plywood. Two kitchen unit strip lights are incorporated into the plywood unit in the top of the layout, making it a form of diorama display. 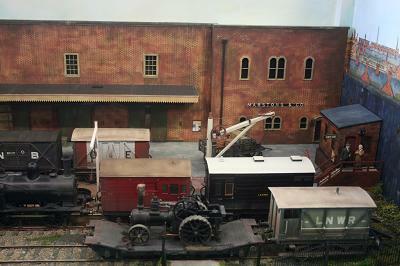 A small cassette type fiddle yard is located to one side of the layout and there is space for a Peco locomotive lift within the large factory. This is only used at home when the fiddle yard is obtrusive. 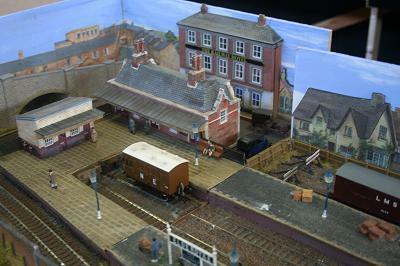 The layout is controlled from the front or back, again so it can be used at home, the first of my exhibition layout built to have this feature. Bishops Street is fully sectioned and incorporates some lighting, mostly to the dubious premises above the exit tunnel but more lighting will be added as it develops. Hopefully it will also be used for experiments in DCC. The elevated LT section is operated automatically via an electronic shuttle unit. 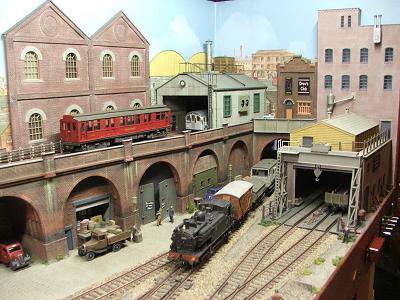 The main buildings are adaptations from the Heljan large brewery kit with the LT servicing shed and background buildings using Wills scenic sheets. The railway arches are secondhand Hornby three arch viaducts, delicately modified with a big hacksaw and raised to allow businesses within the arches. The location somewhere in London has been deliberately used loosely regarding the rolling stock. It is intended to change the regions at times, but the time period will be roughly 1955 to 1965. 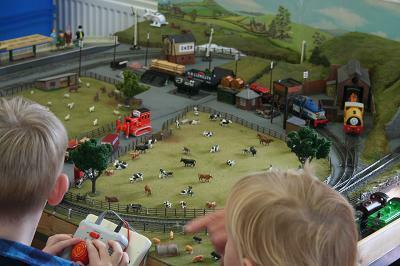 The yard is worked by small locomotives with a yard pilot to assist. Having not built a layout for many years it has been surprising how much time this very small exhibit has taken to build, nearly two and a half years in all. A lot of the time has been spent on the buildings, painting and weathering and trying to blend then into an urban setting. All previous layouts have been rural in nature, so this has been a new experience. Blenheim Road is a fictitious terminus set somewhere in South West London. This allows parcel, milk and van traffic off other regions to access Blenheim Road via the West London line through Kensington Olympia. Layout construction is standard, timber frame with plywood top. Track and points plus third rail are Peco. Control is Digitrax DCC allowing the use of sound. Buildings are a mix of kits and scratch built. 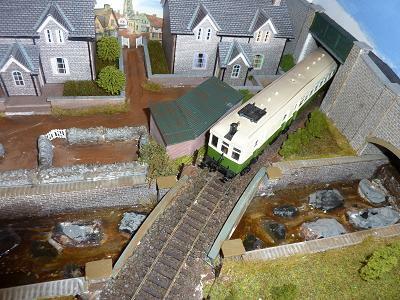 Dock Street Sidings is a self-contained small layout built as a test track and also so I can still run the stock from my now sold “Pixash Lane” layout. 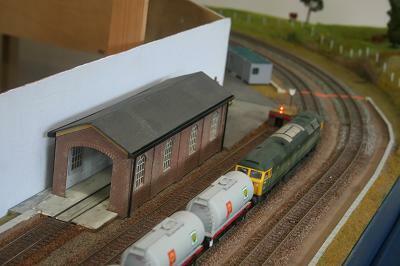 It is a simple set of sidings which can be used as an “Inglenook” shunting puzzle if required. I’ve added a short head shunt off scene to improve operations. The layout has been built using Peco Code 75 track and the buildings are a mixture of scratch-built, plastic kits and L-Cut. I have also made use of the Redutex 3D textured brick sheets. It is loosely based in the 1960/70s and depending on the stock used can be located on the BR Western Region somewhere in the Gloucester area or in the North Wales or Merseyside areas of the London Midland Region. Both Blue and Green diesels are used. 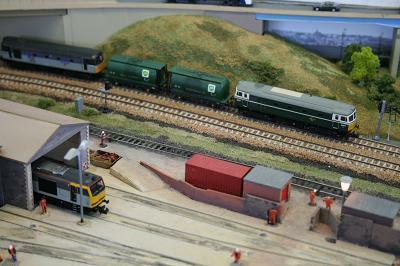 The layout is run with an NCE DCC system and many of the locomotives are sound chipped. The couplings are Kadees which are operated using fixed magnets. We try to operate “hands off” as much as we can. The locomotives are detailed and weathered ready-to-run from Bachmann and Sutton’s Loco Works and the wagons are mainly Bachmann or kit-built. 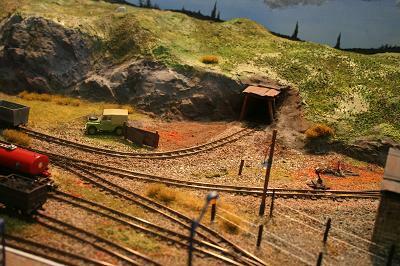 Hillside Mining is our second layout situated in the fictional location of Hillside in mid Wales. 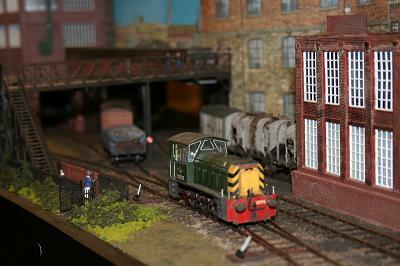 The scale of both is 4mm with narrow gauge track to 009 specifications. The scenario is that of a drift mine that has been reactivated for coal supplies, during the miners strikes during the 1970's. 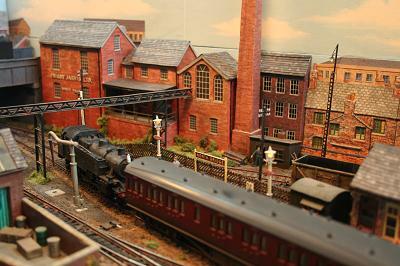 It is situated adjacent to a preserved narrow gauge line of Hillside Works. This allows the use of a mixture of stock, both kit built and propriety, with some preserved steam but mostly working diesel locomotives. 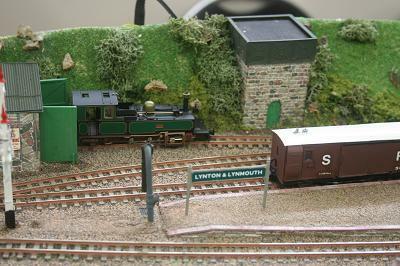 This model depicts the Lynton and Barnstable terminus in the middle of the 1920's as re built by the Southern Railway. The buildings are scratch built, mostly by Colin Hall, based on Wills embossed sheets, using drawings in Stephen Phillip's meticulous book Lynton and Barnstable Measured and Drawn. The station is operated to the Southern Railway working timetable of the period where there were no goods trains, all trains being mixed and including scheduled Road Box workings. Some rolling stock remains in the L&BR livery, whilst others are in Southern Railway colour scheme. 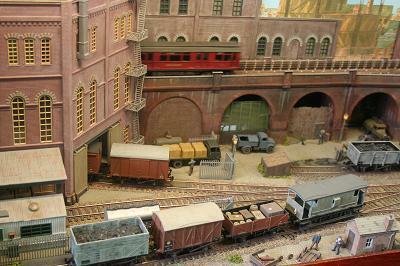 The locomotives are Heljan, most wagons and carriages Peco, and some kits from Langley. Peco 009 track and paints are laid. 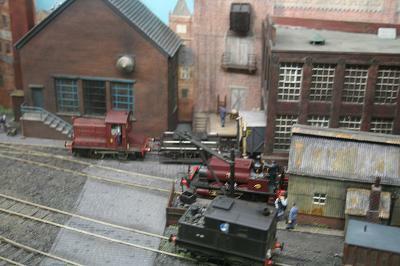 The yard crane was built by Colin Hall from an etched brass kit. Minehead is not the first Great Western Railway branch line terminus that springs to mind when thinking of a suitable prototype to model. Everyone thinks of that enormously long platform for the excursion traffic and decide they have not got the space. 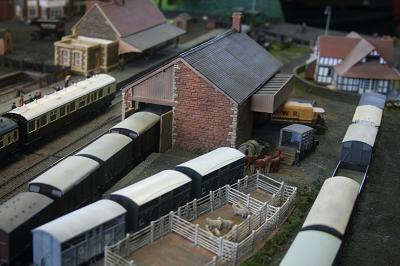 The station area has not always been as big as it is now, in the early 1930's it was still quite a manageable, modellable size, it was therefore decided to Model Minehead as it was then. 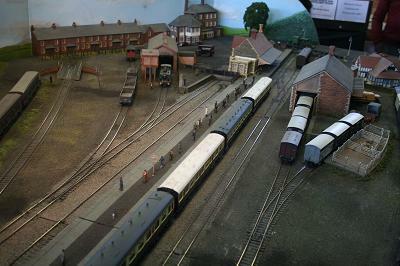 Complete with engine shed, carriage sidings and turntable. This is one of those complicated turntables with extension rails that allow engines longer that the bed be turned. 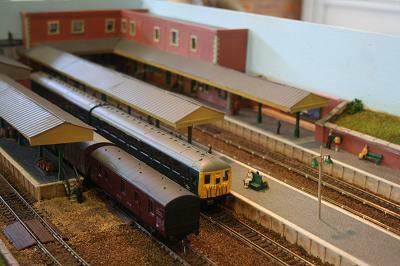 We have made models of stations on the line to Minehead before, Wilton and Dunster. We always enjoyed trips to the line which is beautifully preserved by the West Somerset Railway. 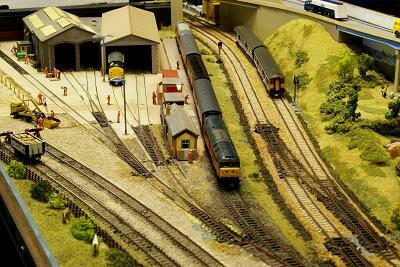 Modelling stations on a preserved railway is so much easier than trying to work from just photographs. Our layout is built on a plywood, flat topped, baseboard. The track is Peco code 75 on a cork base. 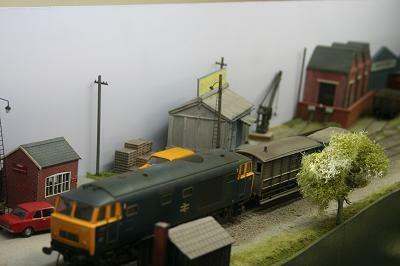 Scenery is mainly Woodland Scenics and the buildings are scratch built, the station is a modified Hornby kit. Signals are Ration operated by Fulgurex motors. Rolling stock used on the railway is modified proprietary with some kit built items. We still have a lot of coaches to build. This layout began life as a 7mm scale test track for newly built locomotives and rolling stock that I like to construct. 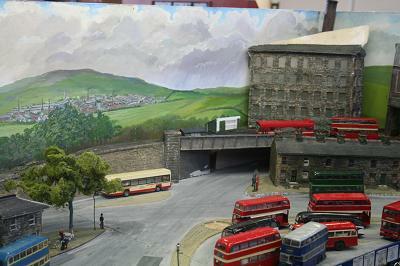 Somebody suggested I develop it into a fully scenic cameo layout which is how it became Queens Street Yard. This required the construction of a purpose built fiddle yard, backscenes, lighting and a fully functioning power box instead of the temporary wiring used in my workshop. My favoured timescale is the pre grouping period as there was such a wide variety of locomotives and rolling stock in many different liveries. 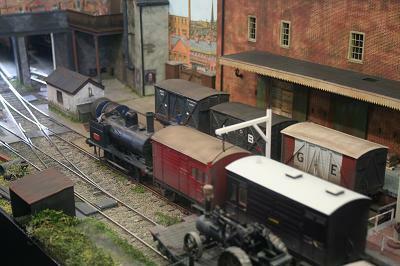 The layout is modelled as a typical Victorian small back street goods yard not aligned to any particular railway company thus allowing me to run a variety of stock. Most of this is London and North Western Railway with the occasional Great Eastern interloper. All stock is now fitted with automatic couplings instead of traditional three links for ease of operation at shows. All the scenery is constructed from card, foamboard or plasticard faced with embossed plastic sheet to give the brick or stone textures. 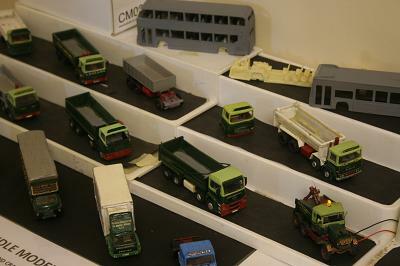 Some of the details are from cast kits as are the vehicles and figures. The locomotives and rolling stock are all built from brass or plastic kits modified where necessary to improve the detail. All are spray painted and then weathered to suit. 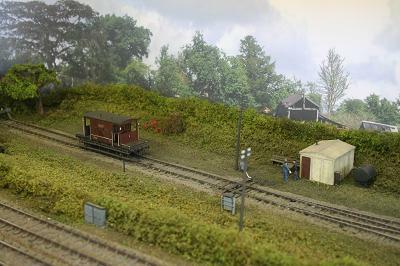 The two turnouts are hand built and operate manually by slider switches connected to the tracks with brass rodding. Most of the plain track is Peco but some is hand built. As a test track everything was made of items already in my spares box so it is a real hotch potch! Including the wiring, this was laid across the surface of the board so is consequently now buried under scenery! Not ideal. If I started the layout again far more planning would go into the initial design especially the wiring but as a converted test board it has given me a lot of pleasure, I hope you enjoy it also.